What a life for a cat! A goal to aspire to. This story was thrown my way by one of the anti-declaw troops, Susan Woodhouse, and I must thank her. Sometimes our merry band of troops feel like ours is a lone voice in the dark. Well, I feel that but some of the troops might not. So it is particularly pleasant, refreshing and motivating to see that one good man in California, who is in a position of authority, actually agrees with us. I could scream with joy. I feel like going to the golden state and hugging the guy! His name is Pedro Nava. He is what is described as an ‘Assemblyman’. In other words he is part of a group of politicians in Californian who make state law. Late last year there were a spate of cites, 8 in all who banned declawing. This was forced on them in part because the state banned cities from creating law that interfered with veterinarian practices and gave that authority to the state. Now the state is going to make some anti-declaw law, if we are very lucky. Mr Nava, sensibly I think, decided against going for an all out ban across the state as he felt it wouldn’t get passed – he is correct! There are too many vets interested in keeping it. As a result he wisely decided on a lesser but more effective (in the long term) bill that bans landlords stipulating that tenants must have declawed cats when renting (and debarked dogs). This has always been a rather unpleasant and totally unnecessary demand as a tenant can simply pay a larger deposit to cover any damage incurred and in any event the lease will protect the other tenants and the tenancy agreement protects the landlord. You don’t need to brutalise a cat in the process of letting a flat! As usual the good old California Veterinary Medical Association oppose this extremely sensible bill because they disagree with the language used in it. Well if it wasn’t that they would find some other reason. Nunez, representing the vets of Calif wheels out the usual platitudes such as, the decision to declaw or not ‘should be between the cat owner and the veterinarian’. We know that this is balderdash. I will tell him why and by the way I don’t like his use of the word, ‘owner’. This tells us what he thinks of cats and indeed other animals. The better term is, ‘caretaker’. Firstly, the client is the cat so why isn’t the cat in on the decision? The cat would say NO. But we know that the cat has no rights in this decision making. Secondly, the cat caretaker will rarely give informed consent to declawing because they don’t see it as wrong or that it is an operation for their convenience. It most likely that the cat caretaker will follow the vet’s advice, which is skewed towards financial profit. OK, enough of that. I am thrilled about this bill. Thank you Mr Nava. You are one of us, the connected people. You are enlightened and courageous, great qualities for a law maker. We wish the bill a safe passage through the troubled waters of the Californian legislature and wait with baited breath for the outcome. Note 1: In order to show us Mr Nava I have used a picture without permission. I don’t think it will be a problem. I don’t know the photographer. If it is a problem please leave a comment and I’ll deal with it. 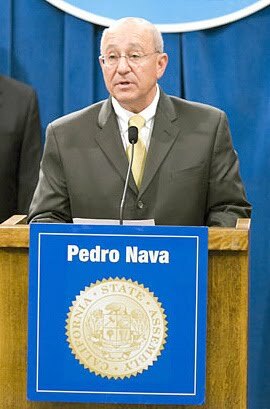 Note 2: Mr Nava is a candidate for state attorney general and is a member of the Legislature’s new Animal Protection Caucus. He is also the author of past animal-protection legislation. Mr Nava, my commendations/gratitude for speaking up on behalf of those not able to vocalize their needs/wants. Mahatma Ghandi said “A nation can be judged by how it treats its weakest members” (in this case defenseless dogs/cats). We must remember that we are CONSTANTLY an spectacle to other nations.It’s a great deed you’re performing. I was overjoyed when I read this article. I was also very impressed by the article itself as it appeared to be for a change very factual. Especially the description of de-clawing using words such as ‘bone’ and ‘amputation’ instead of ‘claw’ and ‘laser’. No surprises to see the same old rubbish from the CVMA although I do kind of think they appeared to be very transparent this time with their feeble excuses. Lets hope everyone else thinks so too. Fight on vets and veterinary assocations with politicians like Mr Nava the nets are slowly closing. I too commend Assemblyman Nava for having the nerve and the decency to stand up and fight to stop landlords having influence over the health and wellbeing of cats (and dogs). I hope this bill gets through, not only because it will save millions of cats (and dogs) untold pain and trauma but also because of the message it sends out, loud and clear that the days of routine declawing on demand are numbered. I too want to commend Assemblyman Pedro Nava for putting forward this bill. Remember, it’s not just the cat’s claws that are removed. It’s cutting off the entire outer joint on each finger! Would you ever do this to a child to stop nose-picking? I hope and pray Mr Nava’s bill is passed.More and more people are now learning just how cruel and uneccessary declawing is and this bill would be a great asset to our cause. I know what you mean Michael about being a lone voice,it does feel like it at times,but there are many more of us in the UK and the USA who have joined the battle now. We have 3036 signatures on our petition and some really great comments. Thanks again to Finn for the brilliant eye catching banner which has definately brought some more in.